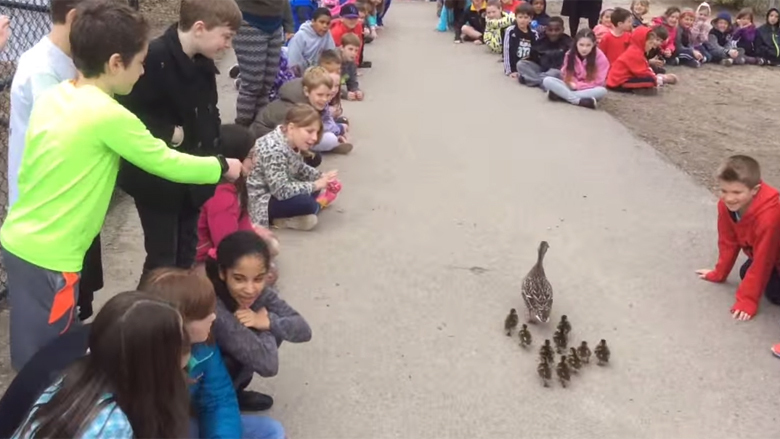 MILTON – In an annual tradition, children who attend Glover Elementary School line corridor walls and campus walkways to watch as ducklings hatched in an enclosed courtyard march behind their Mrs. Mallard to nearby Turners Pond. They’re given a bit of encouragement and guidance along their seasonal waddle, and it all makes for good video. This year, YouTube fans lapped up the downy duckling parade with thousands of views, helping to draw the attention of CNN, the global television news network. During spring, the school traditionally offers a home for nesting ducks in the interior courtyard. After their eggs hatch, the students and staff gather to guide the fuzzy little newborns through the hallways and down to the pond just outside.